day during flex or study period, (depending on what you call it), I would work diligently to get my work done. I also had another trick up my sleeve. I was always decent at math, so during math class, instead of focusing on the lesson being taught, I would look at a few math problem examples in the book, teach the lesson to myself, and then do that night's homework in class, instead of focusing on the lesson. Did I just admit that? Yikes! I'm sure that was not what my teacher would have liked for me to do, but my goal was to have no homework, and it helped get to my goal! Another high school goal of mine was to purchase and own a car. My family did not have much money growing up, and I knew a car was out of the question for me, unless I bought it myself. So, I obtained a working permit at the age of 14, and got my first part time job. I worked hard for the next few years, and saved up some money. By the time I was 16, I was able to purchase my first car, without any financial help from anyone. I think it cost $500, or was it $900? I can't quite remember, but it was definitely under $1,000! The car was older, and in "iffy" condition. It didn't even have proper paint on it. I had to purchase grey primer, and spray paint it myself! Oh, the good old days! I LOVED that car. It didn't last too long, maybe a few years, or less, but the sense of accomplishment I have from working for it, buying it, and owning it, will last for my lifetime. Now, just because I showed a lot of determination in the above examples, does not mean that I don't need a push now and then. For example, I like to keep a clean house. Do I deep clean and vacuum as often as I should? Probably not. 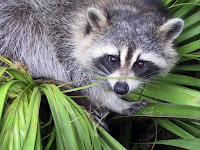 I do keep things generally clean, but sometimes I let the floor go until I just can't take it anymore...or until I have to chase a raccoon who is eating crumbs off my kitchen floor, out of my kitchen! Ok, just kidding, but can you imagine? Teach children to make goals. Help them create simple and appropriate steps to reach their goals. Teach and encourage cooperation and team building skills. When children work together, they learn from each other and are given opportunities to become leaders themselves. Working as a team may strengthen one's interest level and desire to persevere in something. Provide opportunities for children to experience the rewards and accomplishment of hard work. For example, suggest ways for a child to earn money when wanting a desired item, (do chores, do yard work for a neighbor, set up a lemonade stand, etc). Once the desired amount of money has been earned, allow the child to purchase the desired item with the money earned. Read books and discuss role models who have persevered. 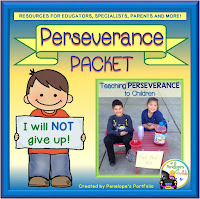 In addition to the above suggestions, I created a Perseverance Packet that may be used by teachers, parents, school counselors, social workers, special education teachers, speech therapists, and other specialists. 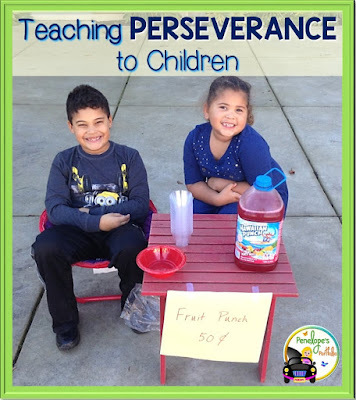 Included in this packet are activities, printables, posters, awards and more. I hope you get a lot accomplished today! You are definitely a goal setter! Can't wait to check out your Perseverance Packet. Great post! Such an important skill for children (and adults) to learn!